Sheryl Crow performs at the Elton John AIDS Foundation's 17th annual "An Enduring Vision" benefit gala at Cipriani 42nd Street on Monday, Nov. 5, 2018, in New York. 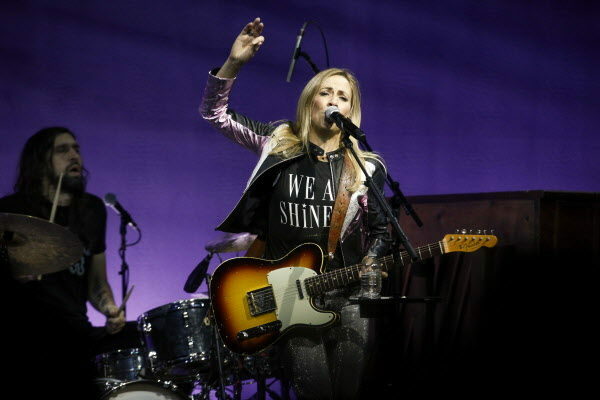 Classic rock duo Heart and multi-platinum songwriter Sheryl Crow will perform this July at the Darling’s Waterfront Pavilion in Bangor, Waterfront Concerts announced Monday. Heart and Sheryl Crow, with guest Elle King, are set for a Tuesday, July 23 concert, with tickets going on sale via Ticketmaster on Friday. Tickets start at $29.50. Heart was founded by sisters Ann (lead singer) and Nancy Wilson (lead guitarist) in 1973 in Seattle, and went on to have major success with such albums as “Dreamboat Annie,” “Little Queen” and “Dog and Butterfly,” and staple classic rock radio singles including “Magic Man,” “Barracuda” and “Straight On.” After a nearly 10-year hiatus between 1995 and 2004, the sisters reconstituted the duo to release several more new albums. In 2013, Heart was inducted into the Rock and Roll Hall of Fame. Heart and Sheryl Crow is the ninth concert announced for the Darling’s Waterfront Pavilion; other rock and adult contemporary acts announced for the venue so far include Lynyrd Skynyrd on June 1, Phish on June 25 and 26, and Train and the Goo Goo Dolls on July 30.